A Break in the Canal. We understand that the navigation on the Canal is again suspended ; a break having occurred last Saturday on the feeder level of the Williamsport Division. 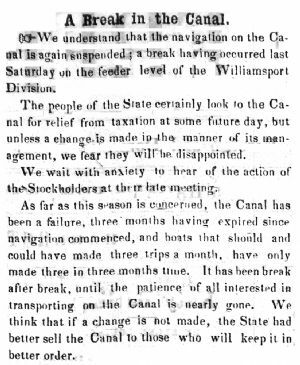 The people of the State certainly look to the Canal for relief from taxation at some future day,-but unless a change is made in the manner of its management, we fear they will be disappointed. We wait with anxiety to hear of the action of the Stockholders at their late meeting. As far as this season is concerned, the Canal has been a failure, three months having expired since navigation commenced, and boats that should and could have made three trips a month, have only made three in three months time. It has been break after break, until the patience of all interested in transporting on the Canal is nearly gone. We think that if a change is not made, the State had better sell the Canal to those who will keep it in better order.